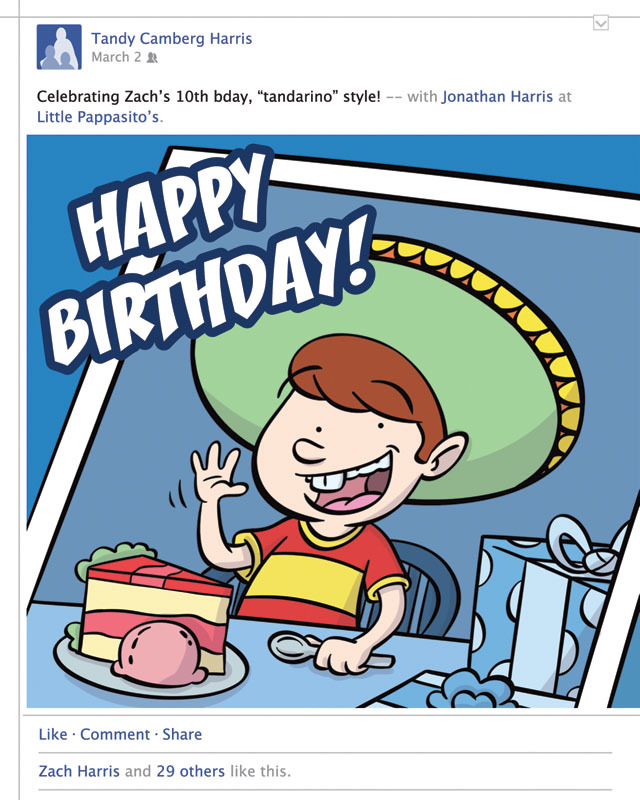 Tandy Harris is famous for putting extra thought into her Happy Birthday posts on Facebook. Here is a caricature of a recent post celebrating her son’s birthday. There was a time when wishing someone happy birthday took forethought. Remembering the day, picking out a card, mailing it, making a call. Enter Facebook and its daily reminders of a gazillion of your friends’ and friends-of-friends’ birthdays, and into the ether of the Internet goes the love. Or that’s what I thought when Happy Birthdays started coming via Facebook. It seemed so impersonal – all you do is type in “Happy Birthday,” and you’re done, off the hook. It’s the thought that counts. But wait a minute, what about a “How are you?” or “How are you celebrating?” In our fast-moving, information-overloaded, busy-is-the-new-normal lives, is it too much to ask? And in fairness, Facebook does generate way more Happy Birthdays than we’d ever get calls or cards, messages from blast-from-the-past friends who wouldn’t have remembered – or known – the date without a social network reminder. But still. Was I alone, a dinosaur among well-wishers? A week before his birthday this year, one lawyer who asked not to be named went so far as to remove himself from Facebook, just “as an experiment. The people who really care will call or text,” he says. There are some Facebookers who have manipulated the system, imbuing the impersonal realm of technology with a personal vibe. Allison Zeller is known for posting messages that not only wish the person well, but also give them something to think about, naming famous people who share their special day. “When friends started having babies, I would clip the part from the newspaper that told the famous birthdays for that day,” Allison says. “Then I’d send it to them so that they could keep it in their baby’s book. “When Facebook came along, I’d look in the paper or go online to see the famous birthdays, then use them in the post … a little something extra to show people I really did think about them. I’ll pick someone famous and then someone random, like Mr. T.” Allison shares her birthday with Boy George, Donald Trump and Yasmine Bleeth. Susan picks a different clip every year. This year, she’s upped her ante, commissioning a musical birthday message from former participants in the University of Houston Texas Music Festival. And she’s sharing – the video should be available for use next month via the Festival’s Facebook page.